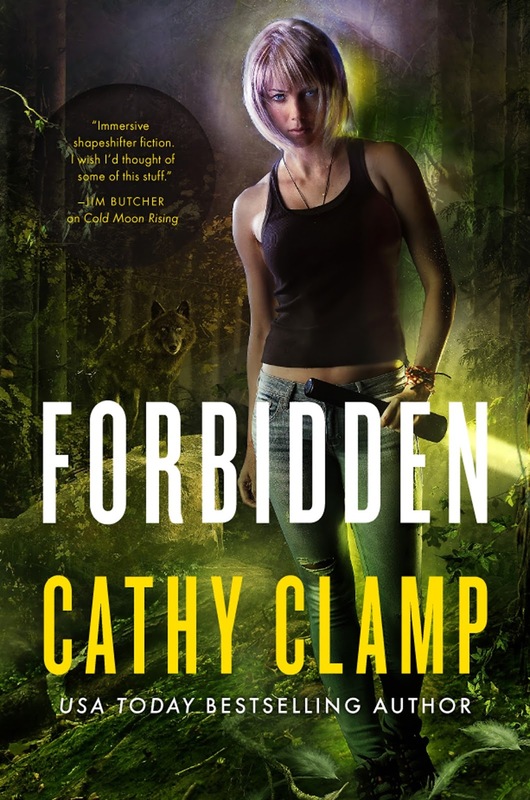 Forbidden is an urban fantasy thriller set in the world of Hunter's Moon - where a shapeshifting people, the Sazi, have retreated into isolated communities. Naturally, these have their own problems, and our heroine, Claire, is sent to investigate the kidnapping of Sazi children in one such community, with the assistance of one of the local shifters, Alek. 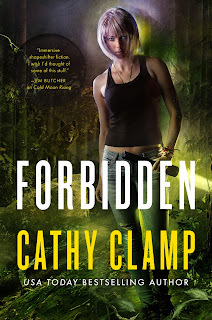 I'll be getting my own review up soon, but more importantly, to celebrate the release of Forbidden (now out, as of the 11th!) Cathy Clamp has kindly contributed a guest post on one of my favourite topics: magic systems! In the world of FORBIDDEN, shapeshifters are magical creatures, tied to the moon phases. But that’s sort of a simplistic way to describe how the magic actually manifests in a shifter. People are different, even shifters. Some have a “talent” for magic, while others simply shift, become animals and then shift back at dawn. In the Sazi world, there are levels of magic ability. At the top of the heap are “alphas.” An alpha feels the moon all the time, regardless of the moon’s phase. They can draw on that energy to shift “off-moon,” pretty much any time they like. But it is taxing. The higher the alphic ability, the less difficult the shift is, so it doesn’t affect them physically. Think of an Olympic track and field athlete. Running a mile or two is just a warm up to the hard stuff. But to an average joe, the mile or two is the whole workout, and to a weekend warrior, a mile or two will have them spitting up their breakfast before the end of the second mile. So it is with Sazi magic. The shifters who are on the Sazi Council, and work for Wolven, the law enforcement branch, are the Olympic athletes. Shifting is a nothing—barely scratching the surface of their ability. Middle of the road alphas can shift off-moon, but will feel like a truck hit them by the end of the day. Most Sazi are in the middle. They’re not alphic, and only change on the full moon. And a “three-day-dog” or omega, who has the weakest abilities, can’t shift off-moon at all and must have help to shift even on the full moon. So, there are as many different levels as there are people. Just like humans! But is shifting all the moon gives a Sazi? Not at all. The highest alphas can do lots of inherent magic. Not casting spells and such, but they have very clever defensive magic abilities. One is illusion, where a shifter can appear to be something other than a shifter. A wolf can influence people’s minds so they look like a dog of similar size. That wasn’t a wolf, it was a German Shepherd. Or a Bobcat can look like a big tough alley cat, or a cougar might look like a bobcat. The birds have it easiest. All they have to do is look a little smaller, and even then, a lot of actual predator birds are HUGE. An eagle’s wing span can reach seven foot, and an eagle owl’s wings can span NINE feet! Another form of magic is aversion. An pack or pride’s alpha can use their magic to make an area feel . . . wrong. People will get the willies the closer they get to the pack. They’ll turn around and won’t go closer. And even if someone is unusually brave, they’ll often avoid an area with glowing eyes in the blackness and low growls! In FORBIDDEN, the town’s alpha uses aversion to protect the town from human visitors during hunts. There are also some offense magic abilities, such as holding. An alpha of sufficient power can use their magic to tighten around another Sazi like a rope, freezing them in place. It can even defeat gravity when necessary. But that takes a LOT of magic, and only a few are strong enough to do that—like Wolven agents and council members. I try to use magic sparingly in the books. It shouldn’t be easy because it can become a crutch. I’m careful to make sure there’s always a price. For example, in FORBIDDEN, one of the characters uses her magic to hold another Sazi in mid-air, after they’d fallen over a cliff. But she couldn’t do it for long, and wound up feeling like she had the flu afterward. She vomited, had chills and was weak as a kitten. So . . . yes, magic exists, but it has limits and will cost whoever uses it. Enjoy the moon magic as you delve into the FORBIDDEN world of the Sazi!